Find a smile in an audiobook! 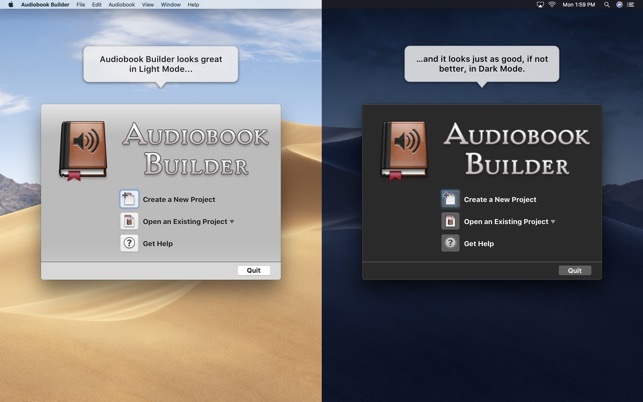 Audiobook Builder makes it easy to turn your audio CDs and files into audiobooks for your iPhone, iPod or iPad. 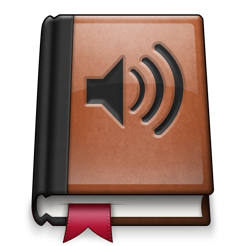 Join audio, create enhanced chapter stops, adjust quality settings, and let Audiobook Builder handle the rest. When it finishes you get one or a few audiobook tracks in iTunes instead of hundreds or even thousands of music tracks! • Audio File Joining: Already ripped your CDs to MP3 or M4A? 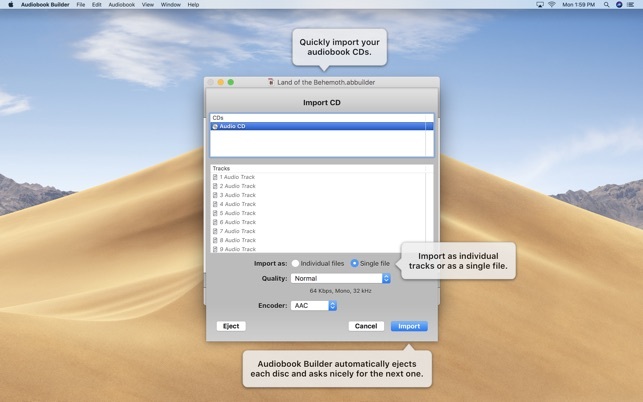 When your files are in the same format and have a constant bit rate, Audiobook Builder can quickly join them together. 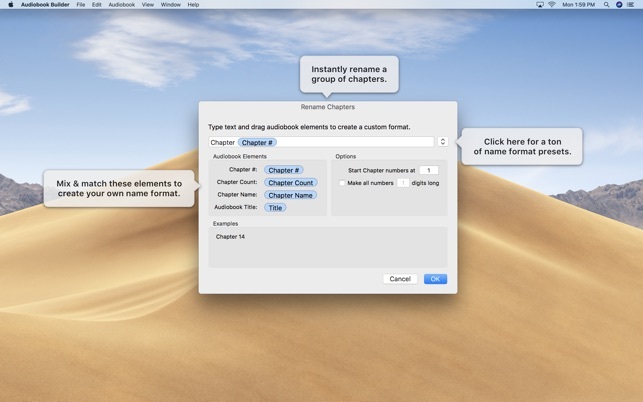 • Enhanced Chapter Stops: Group files into chapters with custom names and artwork. 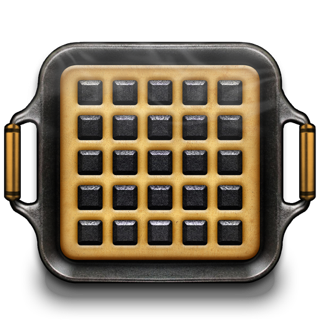 • Adjustable Quality Settings: Use the built-in presets or customize the audio settings to your personal taste. 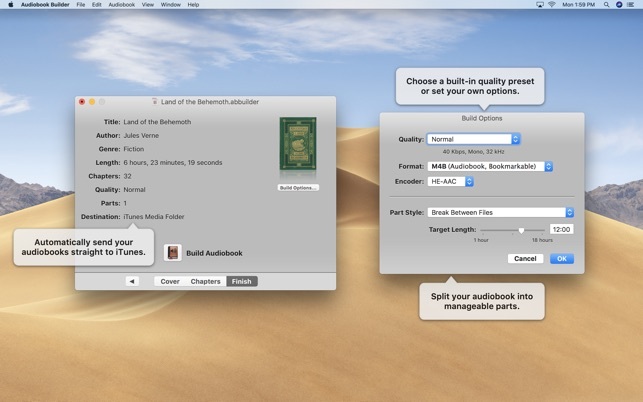 • iTunes Integration: Drag & drop straight from iTunes and build directly to the Books section in iTunes. • Blindingly faster adding files and opening projects. • HE-AAC encoding, for higher quality and smaller audiobooks, alongside the regular AAC encoding we’ve always supported. • macOS Mojave dark mode support. 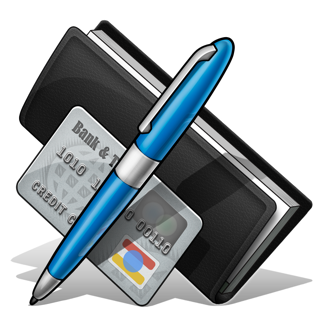 Send questions about Audiobook Builder to support@splasm.com. We're happy to help! 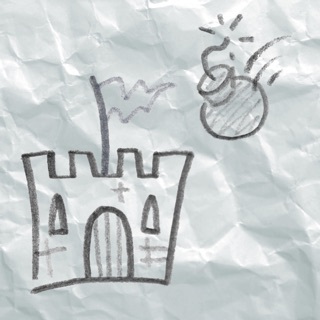 • Nixes an issue preventing the built-in help from working. For quick answers, please go to the Help menu and click Audiobook Builder Help. I'm extremely happy with this program. I have a lot audiobooks on mp3 that are really hard to listen to with a standard audio player. My dream was to convert them to AudioBook format, save them in iTunes and then play them with the excellent player from Audible. Audible keeps your location and lets you rewind in 30 second increments right on the lock screen. 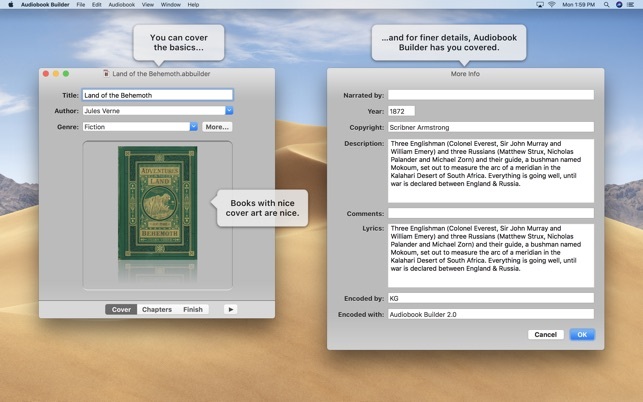 Anyhow, the Audiobook Builder 2 lets me convert books with cover art and control over grouping and splitting with ease. I couldn't be happier and thanks to this software. Well done! 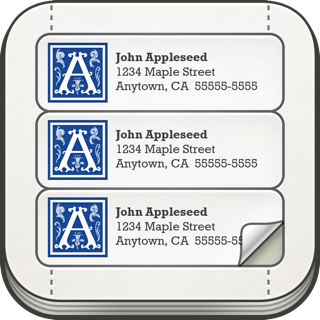 I have been very impressed by this little application. I learned about it through a post on 9to5 Mac and wondered if it would solve the problem I’ve had with audiobooks being a flurry of scattered files. This pulls all those audio files together into one, nicely bundled audiobook file, complete with artwork and book details. My one complaint, is that the length an audiobook file can be is maxed out at 18 hours. This feels arbitrary and I do have a few audiobooks just over 18 hours. It’d be nice to have this either set higher or removed altogether. Hello! We break your audiobooks into parts because applications like iTunes on the Mac and Music on the iPhone and iPad aren’t able to play tracks with more than about 2.1 billion audio samples. That means your parts can be shorter or longer depending on the audio sample frequency. For 44.1 kHz, Audiobook Builder’s High Quality setting, the maximum part length is around 13 hours. If you go with 32 kHz, the Normal Quality setting, you can get 18 hour parts. Customize and go all the way down to 8 kHz and your parts can be up to 74 hours long! Thank you for telling us how you feel about the part length limit. I hope this reply helps explain things. Please reach out to support@splasm.com if you need any additional details! I know itunes can combine files into audiobooks but it is messy. I had files all over the place and every time I retried it was worse. This eliminates all of those issues in a super easy UI. I couldnt be happier. © 2006-2019 Splasm Software, Inc.